Want to make your car stand out for the Holiday season? Try one of these festive car decorations. They’re all inexpensive, easy to apply, and reusable for years of festive driving. You’ll be sure to bring jolly good spirit with you everywhere you go! This is the classic Holiday-themed car costume. It’s fun, easy to put together, and it’s reusable. All you have to do is apply the reindeer nose (lighted versions are available, too) and the reindeer antlers to turn your car into a festive site each Holiday season. Santa doesn’t always have to travel via a reindeer-pulled sleigh. 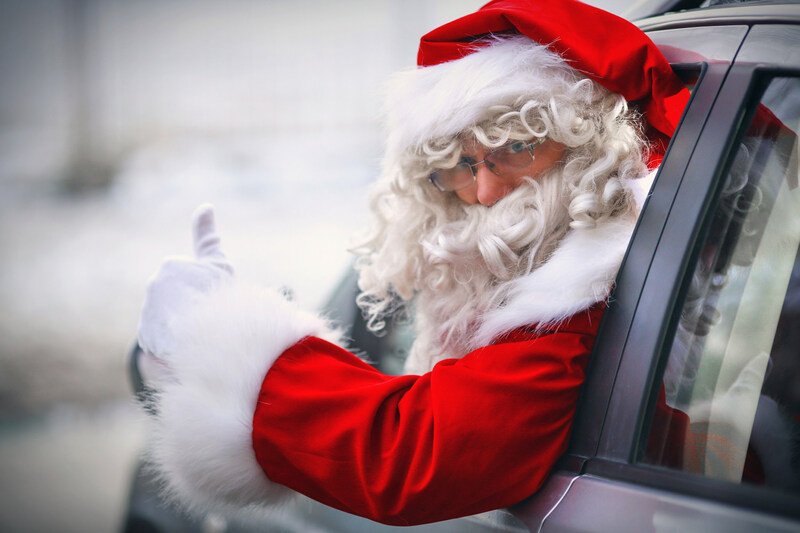 With the Santa window cling, you can bring santa with you in the back seat of your Buick from Bradshaw Automotive. If you don’t feel like driving a Santa mobile, other versions are also available, such as a snowman. You may not want to cover up the handsome grille of your Buick, but you may find that a dash of scarlet will actually enhance it during the Holiday season. This large red bow is easy to attach to your grille and can add a welcome dash of warm color to a dreary winter scene.